IEC 61850/62351 Substation Automation Systems Cryptographic (SASCrypt) IP Core secures the strict real-time traffic used in the Substation Automation Systems and in new Smart Grid premises. As an example, it protects GOOSE and Sample-Measured-Values (SMV) frames used to communicate critical equipment within these premises like Merging Units or IEDs. This IP implements the new IEC 62351-6 standard that ensures interoperability and allows coexisting IEC 61850 protected and non protected traffic in the same network. This standard defines the encryption and authentication mechanisms that shall be applied to Layer 2 IEC 61850 frames. This low-latency IP Core is capable of encrypting, decrypting and authenticating GOOSE or SMV at wire-speed. A very important topic in the scope of IEC 62351 is the keys management and distribution used for the protection. 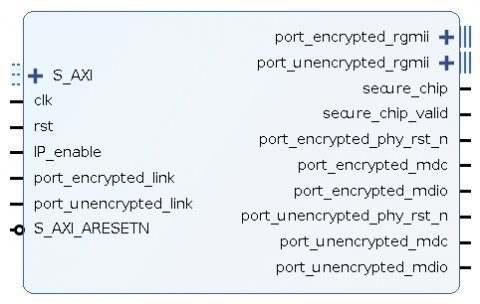 SASCrypt IP Core allows different schemes for security keys introduction into the equipment. Since an static way to introduce the keys into the IP till a fully automated solution for security key management as defined in IEC 62351-9: “Cyber security Key management for Power System Equipment”. SASCrypt IP Core integrates a proprietary low-latency cryptographic cipher specifically optimized for this task. This cipher module provides the required performance with an optimum resource utilization and introducing a delay of few microseconds. Indeed, SASCrypt IP allows modifying at synthesis time the trade-off between the supported data throughput and the required FPGA resources for the implementation. In addition to the protection functionality, SASCrypt IP Core IP Core also supports IEEE 1588 V2 One Step Transparent Clock Peer-to-Peer (P2P) functionality. This feature allows compensating the residence time of PTP frames as well as the delay of each link. SASCrypt IP Core can be used in combination with SoC-e MES IP Core as well as HSR-PRP Switch IP to introduce Ethernet switching capabilities in the equipment combined with the security. SASCrypt IP is designed to be seamless integrated in your FPGA designs by taking advantage of the new Xilinx Vivado Tool, that allows to use the IP Cores in a graphical user interface and configure IP parameters in an easy way.